Reading and share top 7 famous quotes and sayings about Christian Communion by famous authors and people. Browse top 7 famous quotes and sayings about Christian Communion by most favorite authors. 1. "Authentic faith leads us to treat others with unconditional seriousness and to a loving reverence for the mystery of the human personality. Authentic Christianity should lead to maturity, personality, and reality. It should fashion whole men and women living lives of love and communion. False, manhandled religion produces the opposite effect. Whenever religion shows contempt or disregards the rights of persons, even under the noblest pretexts, it draws us away from reality and God." 2. "The breath, the watchword, the comfort, the strength, the honor of a Christian. If thou be a child of God, thou wilt seek thy Father's face, and live in thy Father's love. Pray that this year thou mayst be holy, humble, zealous, and patient; have closer communion with Christ, and enter oftener into the banqueting-house of His love. Pray that thou mayst be an example and a blessing unto others, and that thou mayst live more to the glory of thy"
3. 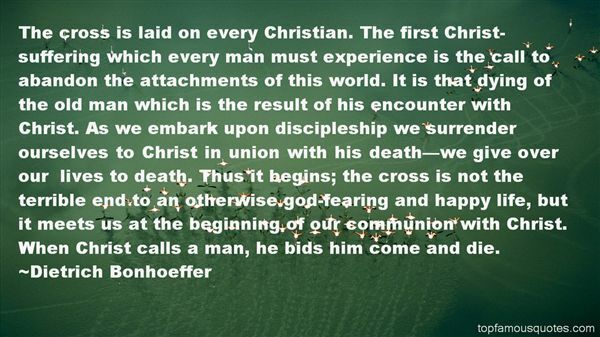 "The cross is laid on every Christian. The first Christ-suffering which every man must experience is the call to abandon the attachments of this world. It is that dying of the old man which is the result of his encounter with Christ. As we embark upon discipleship we surrender ourselves to Christ in union with his death—we give over our lives to death. Thus it begins; the cross is not the terrible end to an otherwise god-fearing and happy life, but it meets us at the beginning of our communion with Christ. When Christ calls a man, he bids him come and die." 4. 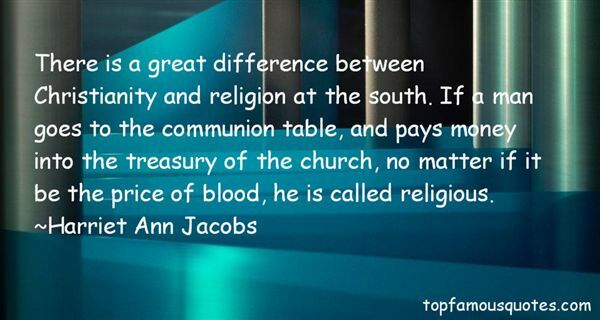 "There is a great difference between Christianity and religion at the south. If a man goes to the communion table, and pays money into the treasury of the church, no matter if it be the price of blood, he is called religious." 5. 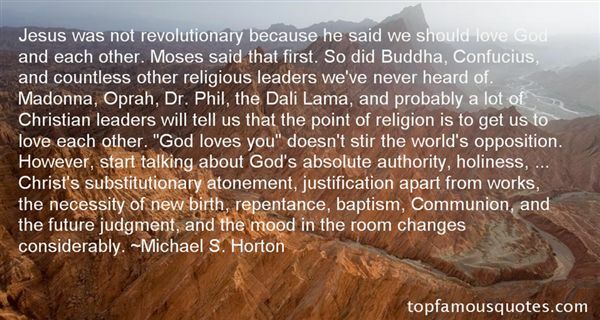 "Jesus was not revolutionary because he said we should love God and each other. Moses said that first. So did Buddha, Confucius, and countless other religious leaders we've never heard of. Madonna, Oprah, Dr. Phil, the Dali Lama, and probably a lot of Christian leaders will tell us that the point of religion is to get us to love each other. "God loves you" doesn't stir the world's opposition. However, start talking about God's absolute authority, holiness, ... Christ's substitutionary atonement, justification apart from works, the necessity of new birth, repentance, baptism, Communion, and the future judgment, and the mood in the room changes considerably." 6. "Because the Christian God is not a lonely God, but rather a communion of three persons, faith leads human beings into the divine communion. One cannot, however, have a self-enclosed communion with the Triune God- a "foursome," as it were-- for the Christian God is not a private deity. Communion with this God is at once also communion with those others who have entrusted themselves in faith to the same God. Hence one and the same act of faith places a person into a new relationship both with God and with all others who stand in communion with God." 7. "The Christian who walks with the Lord and keeps constant communion with Him will see many reason for rejoicing and thanksgiving all day long." Most days, I practice piano in the mornings and I spend the rest of the day painting."